It´s for sure! I get my own little gallery and workshop. In Tivoli in Copenhagen this autumn. It is my 1 1/2 month old concept "Miniatureværkstedet, Miniatures by Lark" www.miniaturevaerkstedet.dk, which will be a unique magic cocktail of a miniature gallery with my original miniature artworks, my miniature design and miniature decorations. All of it has come out of my head and hands or will be produced by me during opening hours, which naturally follows the hours of TIVOLI in week 42- 44 Oct 13th - Nov 5th 2017. Medio June I went through another surgery, this time a planned one in my gullet and I might have to go through 1 more this year. But don´t worry, I am a prof. Actively, I have chosen to do without the sufferer role. I´ll be ready in Tivoli on time. Last year I opened my exhibition at the Woven Heart Art Museum as planned only 5 days after a surgery for a hormone illness in my throat. So I now what I am talking about. Naturally, not being able to eat normal food for several months and the one surgery after another makes me tired every now and then, so I needed to get off the hamster wheel. Therefore, it suits me really good to only have a 3 weeks exhibition on this untraditional location in this untraditional way. This is where you can meet me in 2017 and nowhere else. It is a new life situation for me, new conditions, so I want to try something new. 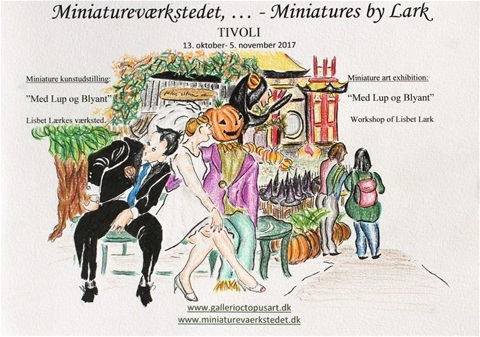 There fore, at Halloween my private suburb workshop/ atelier, Miniatureværkstedet moves into the old garden as a miniature gallery, drawing atelier, miniature design workshop and miniature decoration workshop. I am looking very much forward to further coorperation with the creative team of Tivoli designers and garden architects. I don´t know much about "my" little place yet, except that I will be "living" next to The Pantomime Theatre and close to the Nimb Hotel, too. I have got the arkitect-drawing from the little cuttage, and I also have designed and built the miniature workshop and atelier, which I am working in now on another and unpublic secret location in the city. It makes it easier and quicker to move it into Tivoli, when I know it works out in the room before I move it. Also I need to try off the logistic in the room, before I move into Tivoli in October right before the opening, because "my" little cuttage won´t be set up until some days before the opening.It also gives me the feeling of freedom, which I need wery much at this ponit in my life. Until October I have a lot of idea- and product development going on and the concept development will contnue through the summer in a funny, positive and supporting environment up to the opening af this little place. My private life and destiny hasn´t been nice to me the last couple of years, so I only do things which makes me glad. Glad as in "laugh." Glad as in "smile. "...- and right now at this moment in my life, I need to spent my life on miniatures, I feel. Spending time in Tivoli always makes me glad. There is a positive inspirering atmosphere with lots pf glad people in there. But I am sure they can always use another big smile. I will give them and the 500.000 visitors at Halloween mine, too. "Miniatureværkstedet, Miniatures By Lark" has also already from start got a wide supported FACEBOOK-page, but I can´t get too much. So if you are interested in supporting me for free and followg my building up of Miniatureværkstedet and my gallery exhibition there, you are more than welcome to "like" the page and ask your friends to do the same. On beforehand thank you.